Purple Cabbage and purple potatoes, they fascinate me a lot…purple being my favorite color. These are something you don’t see often in India, so the first time I came across them I was quite taken aback. I was skeptical too about even trying them until a friend assured me they tasted the same though they looked different. So this time around instead of buying the good ol’ white cabbage I picked the purple one. I usually make Cabbage Stir Fry, but this time made Cabbage Rice. 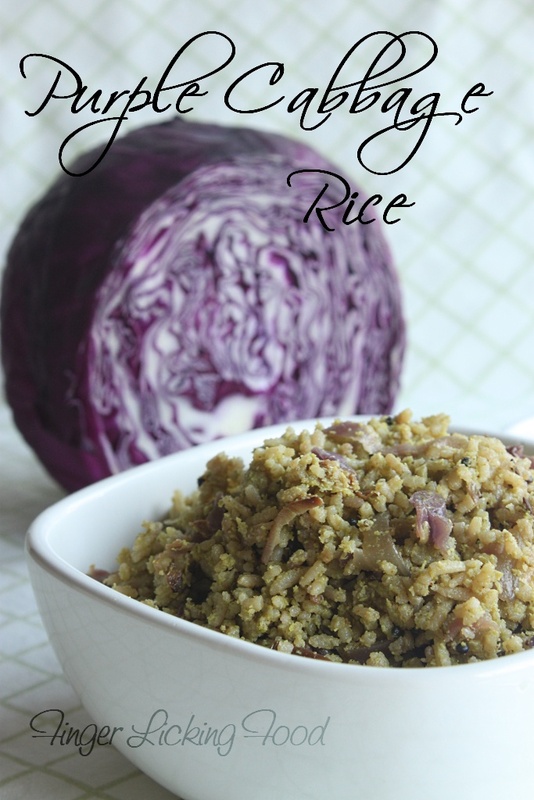 You can make this rice using White Cabbage too, the taste remains the same. 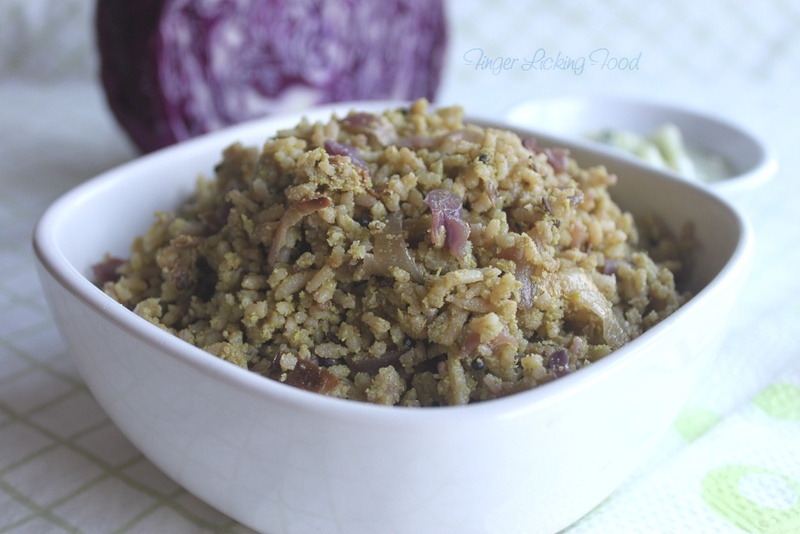 But there is something about the flecks of purple running through this green aromatic rice which is not only a visual treat but one for the taste buds too. Heat the oil in a deep pan. Add the mustard seeds and when it begins to splutter, add the urad and chana dals. Add the curry leaves and onions, sauté until done. Add the shredded cabbage and cook for 5-6 minutes until soft. Now add the prepared paste and sauté for a minute until fragrant. Season with salt and add the cooked rice. Combine well and serve hot with a cucumber raitha. You can increase the number of green chillies if you like your rice to be spicier. Cabbage is one of my fav veggie and flavoured cabbage rice will be amazing. bookmarked. will try sometime for sure. 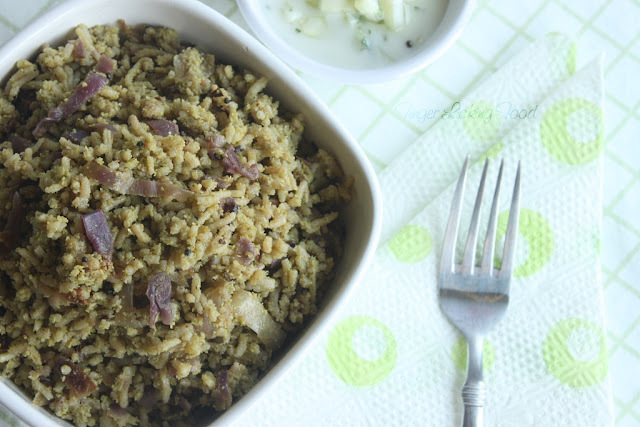 Wonderful bowl, filling and healthy rice..
Yummy and tempting rice..makes me hungry.. Sounds to be a healthy one.... Nice recipe... YUM! Wonderful and new combo. Looks good. I love the color of purple. I would like to invite you to our "Quick and easy recipe mela" and enter your recipe. We would be glad to see your participation. Thanks.